So I know we are less than a week out from Thanksgiving, but everywhere you go people are playing Christmas Music and have their trees, lights and decorations up! So today I got the iPod warmed up for all the "Holiday" music and started to make my playlist. I thought I would list below some of the music that I have (no laughing!) and see if anyone has any recommendations or can think of something I might have forgotten! You can tell what CD's I own....so variations are appreciated. I have updated the "Paleo Links" page on my website. I added the plethora of new blogs (quite a few over the past year! ), some new museum links, deleted some links that were broke and fixed those that have changed. I also added a new section - Student Webpages. If you have one you would like for me to add, or know of some, please let me know! I would like to point out one imparticular today - fellow ceratopsian enthusiast John Scannella, a student at Montana State Univirsity. Check out his new webpage. John has had trilobites on the brain recently. Seriously. I realize that I never really wrote about our trilobite collecting trip to Spence Gulch, Idaho, so I thought I would fill you in. We did find the site. As I mentioned before, Spence Gulch is located in southeastern Idaho (see map below) near the town of Liberty, Idaho. We originally found out about the site from the Geo-Tools website. 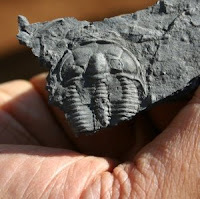 We knew the land is on National Forest Service property, so that was one good thing to find out, as far as invertebrate fossil collecting goes (you do not need a permit as long as you are collection common invertebrate fossils for non-commercial purposes only). Google earth showed us where we wanted to go (also see below), thanks to someone else marking the map. Once we found the right road to turn off of, it was reasonably easy to find. 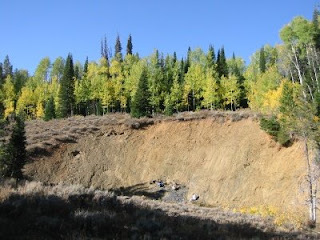 The Spence Shale (Lead Bell Shale Member of the Langston Formation) is exposed in a stream cutbank. While we were there the stream was dry. It is easy to see from an aerial photo but is not visible from the road. Once you see it though, you know you are there. Lingulella eucharis, Acrotreta sp., and Wimanella sp. Feel free to take a look at my pictures from that trip here. A big thanks to my husband who identified all of these bugs and did the bulk of the work! 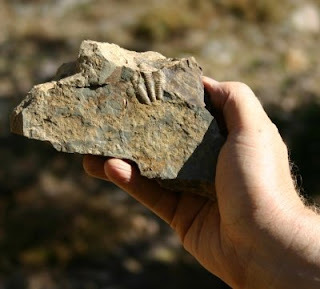 Cliff was unearthed in 2004 on private land in the Hell Creek Formation, its bones still embedded in blocks of rock. The bones were removed from their rock matrix by the paleontological company ZOIC and reassembled as a skeleton in their lab in Italy with missing bones cast by model makers. Cliff's skeleton, which took Museum staff seven days to reassemble for display in Boston, appears as a completely articulated (or free standing) skeleton. Its gender is unknown." "This is the installation of a cast copy of U of Wyoming's Apatosaurus excelsus specimen (Formerly CM 563) at the former Weinman Museum (now Tellus Museum) in Cartersville, GA."
There is also a short video of Tellus Museum's Tyrannosaurus rex being assembled. I will be swinging by the Sam Noble Oklahoma Museum of Natural History to do some work over the Thanksgiving holiday. They have a new Paleozoic Hall that opened this past summer and have a new temporary exhibit, "Hatching the Past," about dinosaur eggs and discoveries that should be interesting to see. The museum also has many great murals by artist Karen Carr, which I always enjoy seeing. I have a copy of her "Jurassic Landscape" that has been hanging in my office for 5 years that I bought when SVP was in Norman back in 2002. It has suffered from the direct light through my windows, so I am looking forward to getting a new copy of that! Getting in the spirit of all things Oklahoman, there was an article a few weeks ago on the Oklahoma News 9 website about "Oklahoma's Dinosaurs" that one of my aunts sent to me. Since I am from Oklahoma I thought I would share the story. "NORMAN, Okla. -- From the highest point of our state, to the woodlands that haven't been explored, dinosaurs can be found in every part of Oklahoma. Dr. Richard Cifelli, a Paleontologist with The Sam Nobel Oklahoma Museum of Natural History, says Oklahomans don't realize what really lies beneath their feet. "Oklahoma is fossils from the grass roots down; there are fossils everywhere," Dr. Cifelli said. "It's truly a remarkable state because of the diversity of the kinds of things we have. People get this idea that dinosaurs are only found in really exotic places like Mongolia or Patagonia." Some of the dinosaur material from Oklahoma is the oldest ever found. 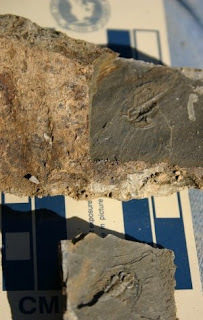 "The oldest material that's from Oklahoma, the oldest vertebrate material, is about 450 million-years-old," Cifelli said. "It's some of the earliest vertebrate material known in the whole world, and it comes from a site in the median of Interstate 35 as you're going over the Arbuckle's." Our official state dinosaur, the Saurophaganax, is only found in the state panhandle (see painting below). "We do feature a very large meat eating dinosaur out there," Dr. Cifelli said. "This thing goes by a kind of complicated moniker, Saurophaganax, but it's basically an Allosaurs on steroids. It's a real big bad Allosaurs. It's got three big claws on the hands and big jaws, so a very impressive one. It's only been found for certain in Oklahoma." Even the animal with the longest neck in the world has been discovered in our red dirt. "The other really cool thing we got from south eastern Oklahoma is this thing we named Sauroposeidon," Dr. Cifelli said. "It's a long necked dinosaur and it's actually related to the Brachiosaurs, but it's about a third larger. It's got the longest neck of any animal known in the world at 39 feet." According to Dr. Cifelli, many of the most recent discoveries have all been found in the same area. "Most of our discoveries through the 1990's and on into this century have been made actually at a state prison property down in south eastern Oklahoma," Dr. Cifelli said. The person who found the dinosaur bones has a unique tie to the prison as well. "That material was discovered by a guy who trains the prisons canine unit," Dr Cifelli said. "His job is to basically run these dogs all over the whole property and he's a backwoodsman and he knows bone when he sees it." Discovery of dinosaur remains still occur in Oklahoma, most of which are found mostly by locals." [link to story] "Jurassic Landscape" is a copywritten image and was used with permission from Karen Carr to R. Hunt-Foster for this blog post. Maybe if we have time on our way back from Oklahoma we can stop by the Denver Museum of Nature and Science and see their temporary exhibit, "Dinosaurs: Ancient Finds, New Discoveries." 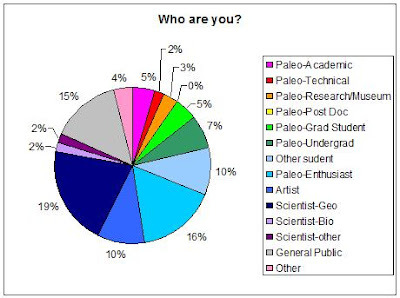 'Geologists' make up the bulk of my readers at 19%, followed closely by 'Paleo Enthusiast' (16%) and the 'General Public' (15%). 'Artist' and 'Other Student' follow with 10% each. The only group that was not chosen was 'Paleo Post Doc.' It is interesting to see what kind of readers come to Dinochick Blogs! Thanks for your continued support. I will try to gear future post towards these audiences. I am thinking of doing some new series here on the blog. 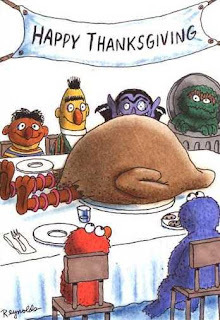 Things have gotten a bit stale as of recently and I apologize for that. If you would be willing to fill out this poll below and let me know a little bit about your background so I could gear these things towards those of you who are my readers, I would really appreciate it (if the poll below does not work for you, please feel free to use the one to the right). I hate trying to "categorize" people, so please do not get offended by any of the categories. Pick as many as you feel "fit" you (you can make more than one selection). It is all private, I am just curious who out there is reading and what I can do to make that experience better. Please feel free to leave any comments on what you would like to see more of here (what you have likes, what you have disliked, what you want to see, ect...). Thanks for your help! Thank you for continuing to come by! This year was my 8th time to attend the Society of Vertebrate Paleontology annual meeting. They have all been great meetings, and I love getting to see every one each year and hear about all of the new and exciting research taking place in my field! I take my camera pretty much everywhere I go (in case you might not have noticed), and I love to document the things that happen at these meetings. I have been posting my pictures from SVP every year on my website (Dinochick.com) and I have done the same with this years pictures. I wish I could have posted them a bit more quickly than I have, but that is life, and I do the best I can with the time I have. So please feel free to check out the SVP 2008 pictures. I hope you enjoy them and please feel free to pass them on! I am always open to suggestions also, so if you see something you like, or dislike, please feel free to let me know! Who is the girl with the fun shirt? Who are these three nice men? Who is the lady to the left please? Who is Bill talking to here? The other day Brian from Clastic Detritus started this domesticated animals in the field meme, with Silver Fox, Geotripper, Bryan, and Life-long Scholar following. So I thought it would be fun to see what kinds of wild animals folks run into when in the field - so consider this a Wild Animals in the Field meme. Feel free to include any funny/interesting stories! From Glacier National Park: I never get good shots of bears. I have seen so many, but I never have my camera in hand when I see them usually. Maybe that is why I am still around ;) Bears are so awesome! This marmot is sitting on a stromatolite. That was pretty cool! Yes, this rabbit is in a tepee. Smart rabbit! There are many more where those came from, but I figured that was probably good for now. What have you all seen?? Hello everyone! 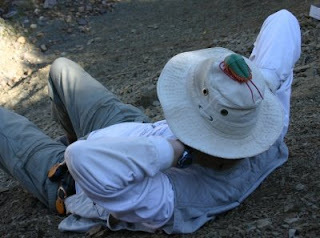 To those of you familiar with the PaleoBlogging world you have probably been to Laelaps (http://scienceblogs.com/laelaps/). The owner of that site, Brian Switek, has made it as one of 20 finalists in the 2008 Blogging Scholarship. That means that he has a shot at winning $10,000 to help finish his undergrad degree and pay off his student loans! Many of us have been there and know how much debt you can build up in a short amount of time, so lets give him a hand! The next part of the contest is based on votes rather than content, however, and he needs your help. Cast your vote here (http://www.collegescholarships.org/blog/2008/11/06/vote-for-the-winner-of-the-2008-blogging-scholarship/ ). Next, if you can, tell your friends or post a link on your blog (if you have one) asking others to do the same! There's no way he can win if he does not get enough votes, and he is going to need a lot of help to beat the political and sports blogs that are already pulling ahead (ick!). Brian needs all the help he can get, and anything you can do to help spread the word would get him a little bit closer to winning. Silver Fox's blog reminded me of this new meme, and since I have not blogged here in a few days (check my other blog), I'll join in on this one (sorry for the over use of the word 'blog' in this post lol). Brian at Clastic Detritus started this domesticated animals in the field meme, with Silver Fox, Geotripper, Bryan, and Life-long Scholar following. So here is my contribution for the domestic side of things: a horse. 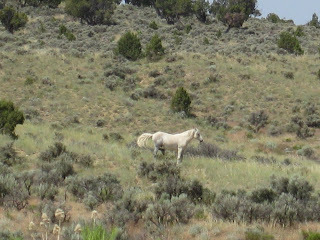 I saw him this summer while working in the Piceance Basin. He did not want to have anything to do with me, other than watch. I really could have used a ride out of there about then too. Ahh well. Have you ever had one of those moments in your life that you thought would never, ever happen? Something people told you you could not do? Something people told you would never amount to anything? Something you spent years of your life working on?? I have. And today hell froze over. That's right, my first paper in a journal that people actually read was published today! Hunt, ReBecca K. and Thomas M. Lehman. 2008. Attributes of the ceratopsian dinosaur Torosaurus, and new material from the Javelina Formation (Maastrichtian) of Texas. Journal of Paleontology 82(6): 1127-1138. Sorry, I had to get that out of my system! Symbolism anyone? Yes, Vader is this project. Its all about getting it out of your system and being able to let it go and move on to the next thing. Having this paper finished and actually published is quite the relief. That being said, I will post a pretty picture from the paper here along with the abstract and I will discuss the paper more at length when I have had time to calm down some. ABSTRACT—A bone bed in the middle part of the Javelina Formation (Maastrichtian) in Texas yielded parts of about 37 identifiable ceratopsid dinosaur bones, mostly appendicular and limb girdle elements belonging to one juvenile and two adult individuals of Torosaurus cf. utahensis. The bone bed is a lag assemblage comprising large immobile parts of the skeletons accumulated in an abandoned stream channel. 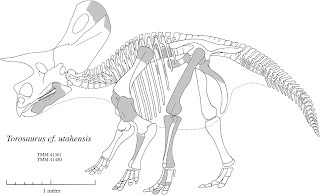 In general form and proportions the postcranial bones are similar to those in Pentaceratops sternbergi and are not as robust as those in Torosaurus latus or Triceratops horridus. A few cranial elements are preserved, including parts of a parietal, squamosal, maxilla, and two dentaries. The form of the parietal fragment is comparable to that of a more nearly complete specimen of Torosaurus cf. utahensis collected nearby at about the same stratigraphic level. The bone bed material provides a basis for the first skeletal reconstruction of this enigmatic horned dinosaur. Most characters used in diagnoses of T. utahensis and T. latus are inadequate. Only the raised bar along the squamosal/parietal suture, present in T. latus; and the midline epiparietal, absent in T. latus, may discriminate the two species.